Home › • IN AETERNUM ‎– The Blasphemy Returns 10"
• IN AETERNUM ‎– The Blasphemy Returns 10"
Swedish inexorable satanic deathmachine IN AETERNUM conjures a new blood-drenching EP entitled "The Blasphemy Returns"! 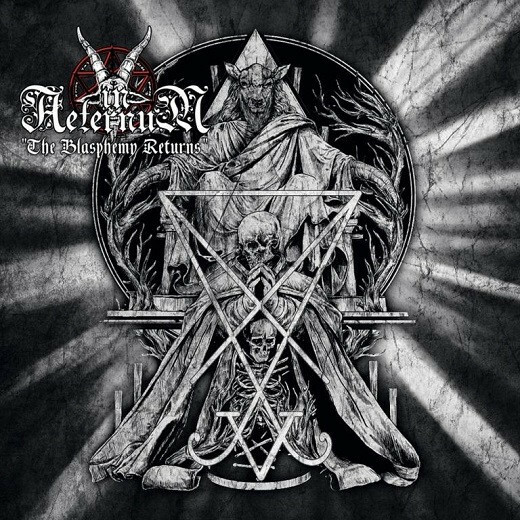 With their scorching deadly riffs soaked in highest regard for the horned one, "The Blasphemy Returns" is a ruthless audio debauchery of Blackened Death Metal infamy - wimpy posers stay away! Featuring a revamped version of the band&apos;s 1999 debut album "Forever Blasphemy" track opener &apos;Majesty Of Fire&apos; with 2 brand new tracks and plus an exclusive War cover song &apos;I Am Elite&apos;, "The Blasphemy Returns" will be available in both CD and 10" vinyl version with denomination of 200 Black vinyl and 100 White vinyl with black splatter.